Teima Onorio made history when she became the first female Vice President of Kiribati in 2003, a position she served in for three consecutive terms until 2016. Onorio first entered politics in the Parliament in 1998. During her time in government, Ms Onorio held various ministerial posts including Minister for Internal and Social Affairs; Minister for Education, Youth and Sports Development; and Minister of Commerce, Industry and Cooperatives. 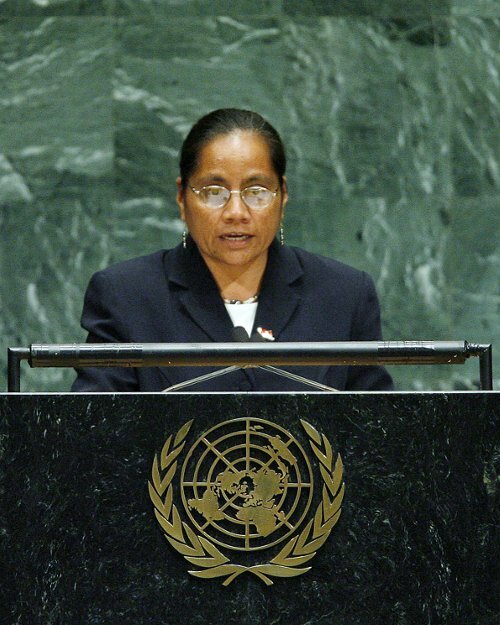 As Vice-President of Kiribati, she represented the Alliance of Small Island States at the United Nations, speaking on the topic of climate change. “We have been disappointed with the lack of consensus on these critical environment issues,” she said in her address. “Indeed, we deplore the notion that economic growth should take precedence over environmental issues when the quest for that growth will threaten the very survival of some members of this organization,” she said. Prior to joining government, Ms Onorio was an educator, working in a variety of roles including English teacher, head of department at the government secondary school and later held senior administrative posts at the Ministry of Education, Training & Technology. She was educated at Victoria University of Wellington and the University of East Anglia in Norwich, England.